A small British company has announced the arrival of its new PMP and is claiming the gadget has enough firepower to outflank Apple's miniature range. The Sonix7 Media Pro sells for a pinch over £100 and features a 3.2 inch TFT screen with touch capabilities, while boasting a battery life of 30-plus hours for audio and 20 hours for video. The company is very proud of its British roots and feels that in the current economic market, the Sonix7 is perfect. "Value for money is what people demand in today's economy," explained Morris Ahmed, MD of Sonix7.co.uk. "We wanted to give an easy-to-use player with as many features as possible for the lowest possible price. "We're proud that this is a British-designed and manufactured product which undercuts and outperforms competing players made in China. "Many of the most important leaps in computer development and communications were made in this country, and the Sonix7 is proving that we can still compete with the best in the industry worldwide." 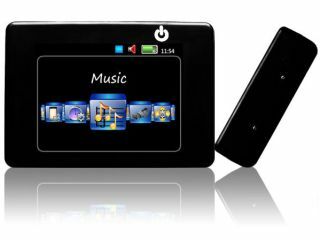 Other features of the 16GB device are that it doubles as an eBook reader (although a very small one) has a built-in speaker and holds around 4,000 songs. There's also no software required, so you are not tied into using one application – we're looking at you Apple.